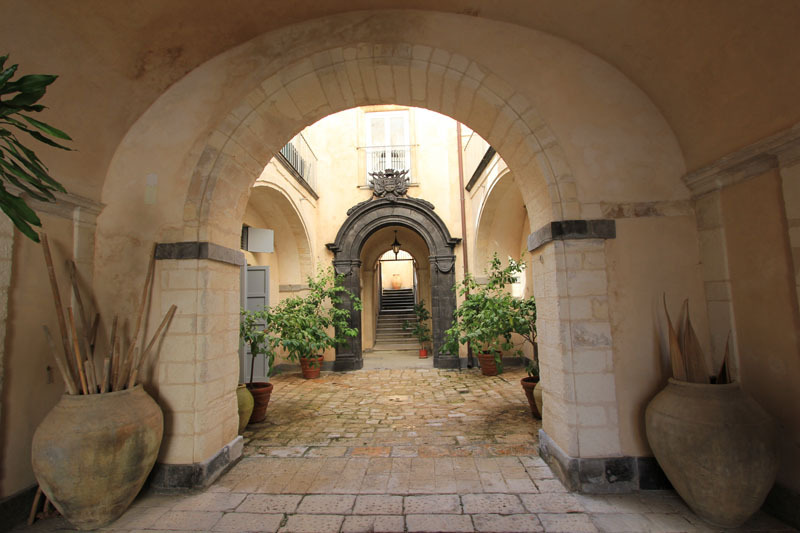 The large courtyard of the entrance, once upon a time used for the carriages, is completely made of pitch stones locally called “Pietra Pece”. At the centre, there is a beautiful arch where curved is the emblem of the family Arezzo by local artisans. The large and original “Pietra Pece” staircase to the first floor, is divided in two and will bring you to the entry hall which is leaded by pictures of all the generations who lived in this house starting with the founder Baron Carmelo Arezzo (1795-1864). Following there are a sequence of rooms from which is possible to admire Piazza Duomo, Corso 25 Aprile and Circolo di Conversazione until you get to the last and largest Grand Ballroom which keeps still his original shape. 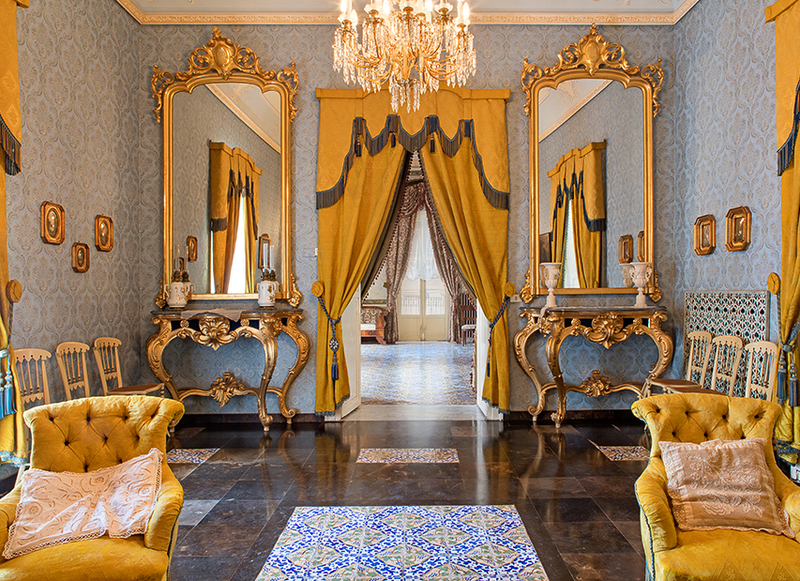 Also decors on the walls representing mythological sceneries have never been restored as well as the neoclassical furniture as the long sofas, two large mirrors, curtains and the hand-made Neapolitan majolica pavement of late 700s. 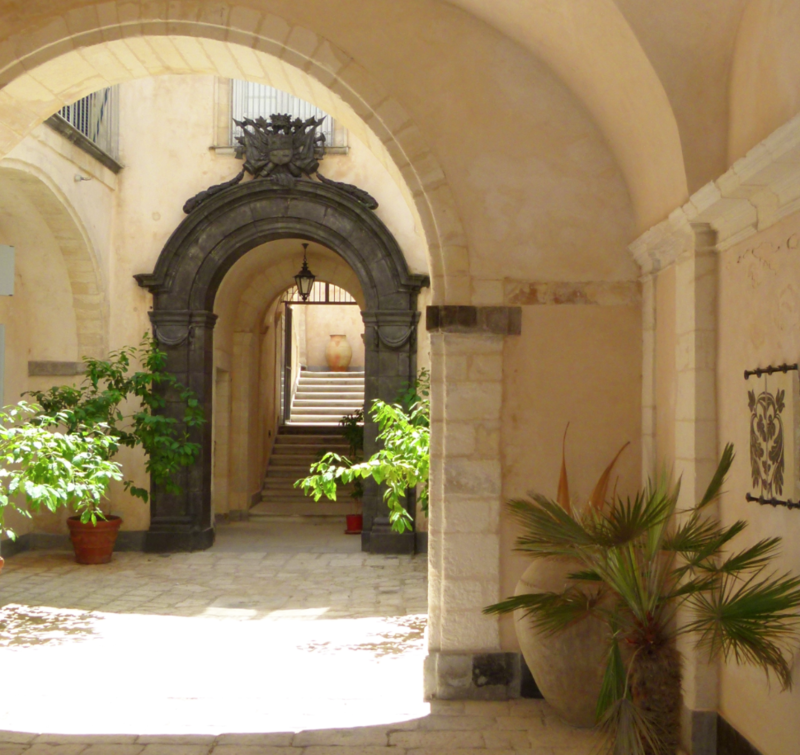 All this make the Palace one of the most researched place of Ragusa Ibla. Although all rooms are adorned with epoch furniture, everyone earns a singular denomination for his particular character. 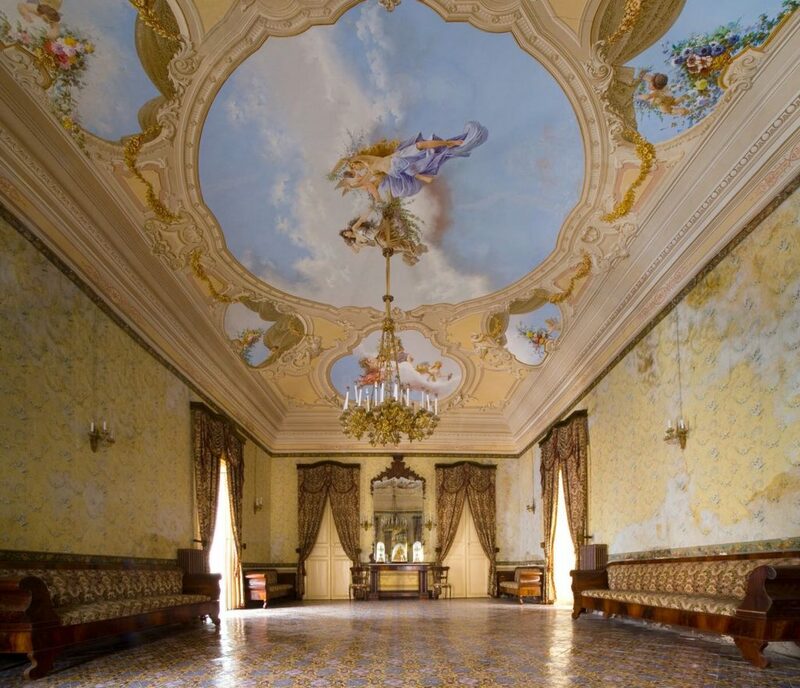 For example the living room is called “Sala degli Angeli” (Angel’s room) for his unique fresco on the ceiling painted by Master Del Campo. There are also “Salone Giallo” (Yellow room) which keeps a local pitch stones pavement with yellow ceramic tiles from Caltagirone, “Salone Rosso” (Red room) where is possible to admire the old family chapel. Nevertheless, restored in the 60s, a wing of the Palace is composed of fine marble (yellow of Siena, French red, extra white of Carrara) cut and hand-woven by the Master Li Calzi from Comiso.